Is it a playhouse? Is it a treehouse? It’s the best of both worlds! 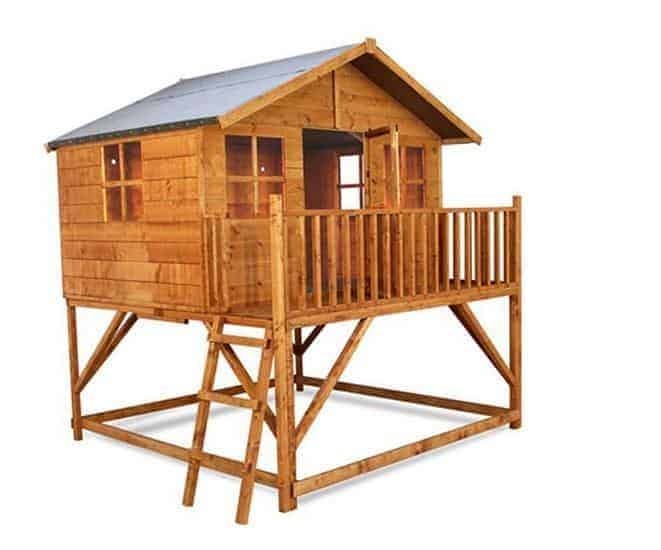 If your kids dream of having a treehouse but you have no tree in which to build one, the Mad Dash Max Tower Playhouse could be just the playhouse that you have been searching for! 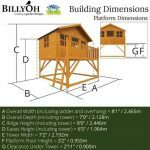 This playhouse emulates a tree house such is the structure as it is on stilts! Complete with a balcony windows and an apex roof it will give the children and grandchildren hours of fun outside. 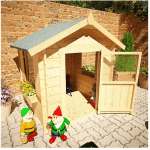 Made out of hardwearing and long lasting wood, boys and girls everywhere will be thrilled with this and it gives them their very own area of the garden to lose themselves in their imagination. A great investment which will last for years. The unique raised design adds an element of excitement and fun to the otherwise standard playhouse design. 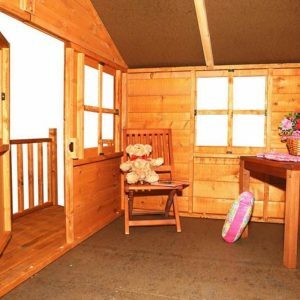 Older children will definitely appreciate the privacy and garden hideaway feel that this playhouse provides and younger children will enjoy it in their own way, growing into its features over time. 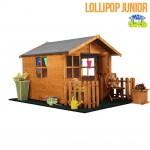 The Max Tower Lollipop playhouse will make a superb feature in your garden and prove to be a big hit with any kids (or big kids!) that may visit. The Mad Dash Max Tower Lollipop Wooden Playhouse: How safe is it? The Mad Dash Tower Lollipop playhouse may look out of this world but just how safe is it for your child and are there any potential safety concerns that parents and carers should be made aware of before purchasing? In this section the team at whatshed.co.uk take a look in further detail at the many features that this particular model has to offer. 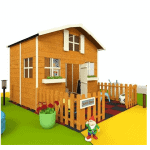 Playhouse: At 7x8ft this is a large playhouse which would make a superb feature and play area for the larger garden. The superb interior space is enough to fit your child and a couple of friends comfortably. No compromise has been made with the design of this playhouse and no space has had to be sacrificed to accommodate the other features. Balcony area: The balcony area runs along the entire front of the playhouse. Accessible by ladder, the ladder is fixed to the balcony to prevent any movement and accidents during play. Younger children will need supervision on the ladder and whilst playing in the playhouse and balcony area due to the height. Windows: The traditional style windows look great and are safe due to not having the open/close feature that may have caused problems due to the height of the playhouse. Door: The door has a window feature that is great for safety as it allows your child to be aware when other children are trying to come inside or simply playing near the door, thus preventing accidents. The Mad Dash Max Tower Lollipop Wooden Playhouse: How easy to build? The Mad Dash Max Tower Lollipop playhouse may look a scary proposition for those new to DIY, but fear not as this model is actually relatively straightforward to build. With the clear and detailed instructions combined with easy-to-follow diagrams to help you stay on track, assembly should be uncomplicated. Your flat-packed playhouse package will contain all of the panels, fencing, ladder, fixtures and fittings that you will require for assembly. A basic set of tools will be required and it is recommended that two people work on assembling the playhouse, not only due to its height and size but also for safety reasons. The Mad Dash Max Tower Lollipop Wooden Playhouse: What is the overall quality like? The Mad Dash Max Tower Lollipop playhouse holds its own when it comes to combining creative design, quality construction and an exciting and unique style that children of all ages will enjoy. 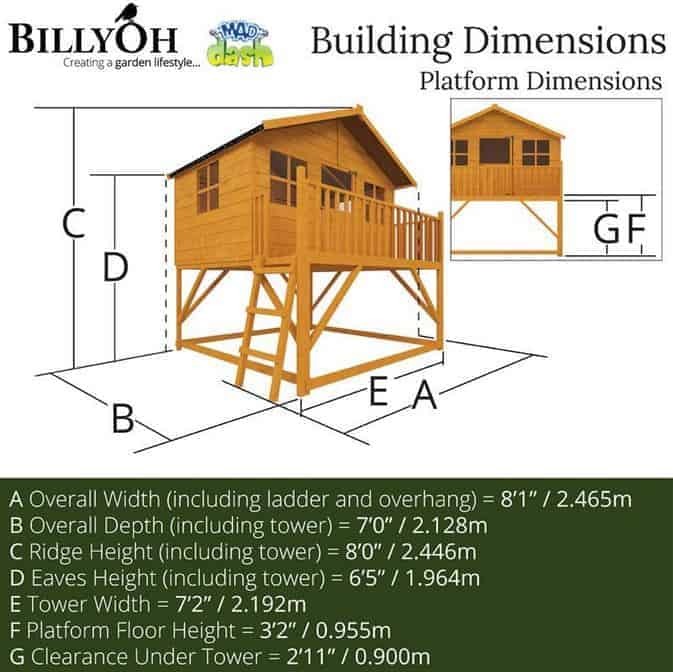 Supported by strong wooden joists, the unique raised treehouse design of this particular model is constructed from quality timber and other fixtures that provide a completely solid structure on which you can be confident that your child can play safely. Being raised from the ground, the max tower playhouse may avoid most of the dirt that other grounded playhouses have to endure. However, should it need a clean to maintain its smart appearance in your garden, then a hose down with water should be sufficient and a sponge and soapy solution can be used to give your window panes a sparkle. 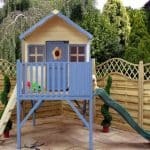 If you would like to paint your playhouse then the unfinished wood makes this possible. 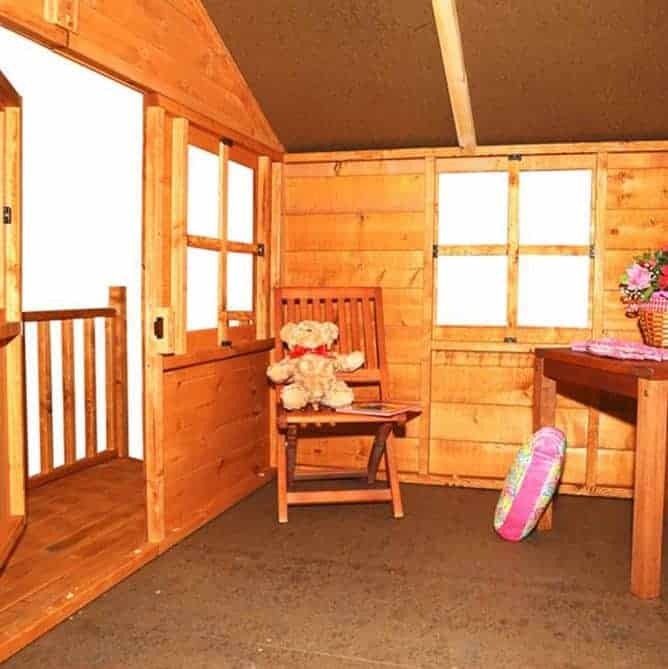 Go ahead and decorate your playhouse making it a place for your child to call their own. 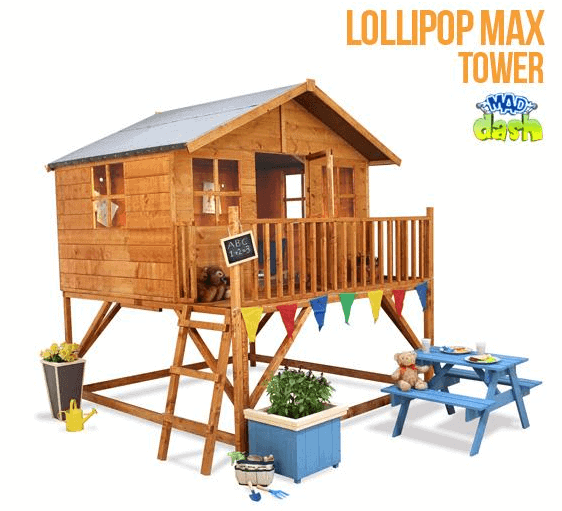 The Mad Dash Max Tower Lollipop Playhouse is the stuff that dreams are made of! The raised nature of the playhouse gives it a unique treehouse feel that older children in particular will adore. Great for both boys and girls, we feel that this model would be enjoyed by a family for many years to come. 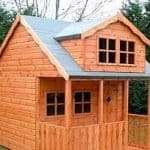 It’s the kind of playhouse that the whole family will love and however small the littlest member of your household, they will no doubt grow into it gradually over time. 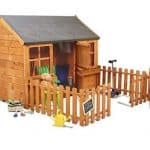 The price for this playhouse is spot on and very affordable for a model that has so many features and so much going for it. Well we couldn’t give them a tree house so we did the next best thing. Now, the assembly is a bit of a pig on this one. Not sayin you need a pro for money but you need two or three people with a lot of patience for instructions that are a little confounding. However, we did it in a few hours and the smiles on the kids faces is priceless. Speaking of which, for the use we will get out of it, we are well chuff with the price. You’ll be surprised at the space you get as well. I thought this was darling because it looked like a California style stilt house and at first I was concerned as to the stability of it but it is quite solid. We put those foam blocks that look like big puzzle pieces you get online for five pound underneath and around the outside a bit and have been quite happy with it. It is a fun and entertaining piece that you can use for a couple years at least if the kids are around 3-5 like ours are. I like to garden and i work a remote position at home so I can work and watch them. The price was in the high range for us but not for what it is and how it serves the purpose.